Israeli soldiers abducted, on Sunday at dawn, five young Palestinian men from several areas in Bethlehem and Jerusalem, in the occupied West Bank, the Palestinian Prisoners’ Society (PPS) has reported. The PPS said the soldiers stormed and violently searched many homes, and interrogated several Palestinians, before abducting three. The PPS office in Bethlehem said the soldiers invaded homes in ‘Aida refugee camp, north of the city, and abducted Daoud Mahmoud Khatib, 23. 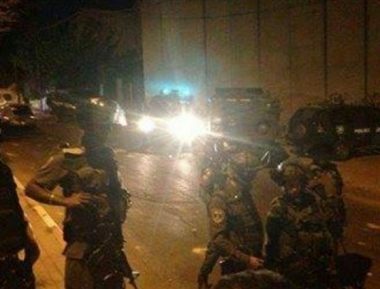 It added that the soldiers also abducted Malek Emad Salama, 22, from Beit Jala city, west of Bethlehem, and Mahmoud Yousef Obeyyat, from Hindaza area, east of the city. In addition, the soldiers invaded Ein al-Louza neighborhood, in Silwan town, south of the Al-Aqsa Mosque in occupied East Jerusalem, searched several homes before abducting Amir Abu Sbeih, 17, and a former political prisoner, identified as Tareq Khaled Odah.